Over the past decade, Vermont's food landscape has seen a gustatory revolution. Menus tout local ingredients aplenty, and global cuisine is on the rise: Within a few weeks Burlington will be host to not one but three Himalayan restaurants, for example. Even so, there are times when diners crave something we can't find locally. And that's when we look northward for even more dining options. As southern Québec's highway A-35 nears completion, Vermont's closest big city is easier to access than ever. In our new occasional series, Bouffez Montréal, we'll share our favorite finds — a particular cuisine type, neighborhood or even hard-to-find dish — to help our readers get acclimated in that city. This first installment is dedicated to Korean fried chicken, or yangnyeom tongdak. 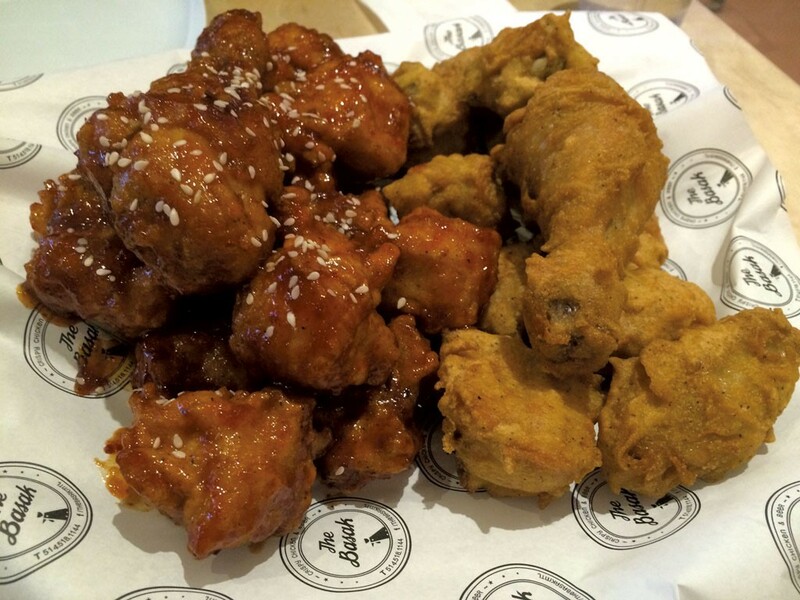 When massive Korean-owned chains KyoChon and Bonchon arrived in New York City late last decade, Americans began to develop an appetite for the extra-crispy, twice-fried birds. Montréal was slow to catch on, partly because the chains never opened locations there. The city welcomed its first KFC (the tongue-in-cheek abbreviation for Korean fried chicken) joint about a year ago, followed in the space of seven months by two more. Each is independently owned. On a recent Saturday, we hit them all to compare their juicy, spicy merits. In late March 2014, DaWa Poulet Frit & Grille Coréen opened on busy rue Sherbrooke in the Notre-Dame-de-Grâce neighborhood. There's a Korean-Japanese market next door and giant Persian supermarket Akhavan is across the street. The diverse area has a feeling similar to that of Astoria, Queens — an ideal setting for Montréal's first devoted KFC spot. 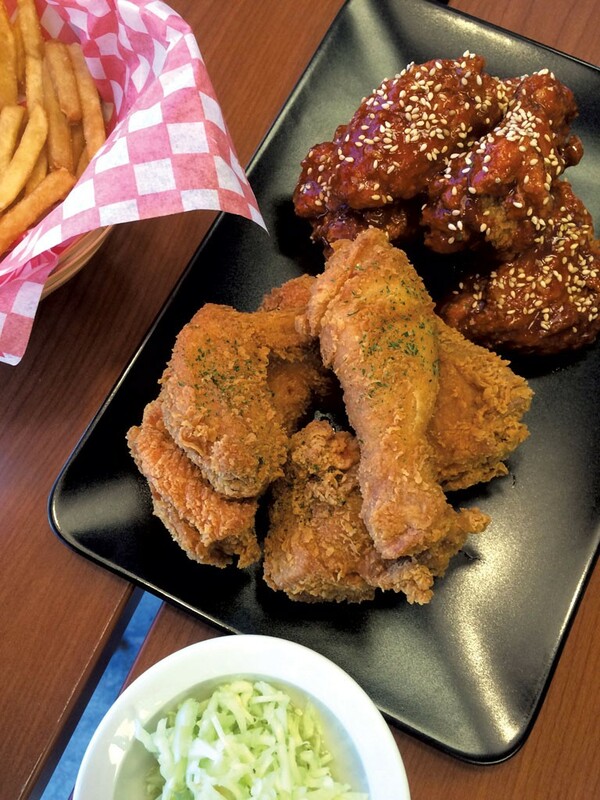 Other restaurants, such as Shabu Shabu BBQ Corea, an all-you-can eat barbecue joint on the outskirts of the NDG 'hood, have long served fried chicken as an incidental part of the menu. At DaWa, it's the main attraction. 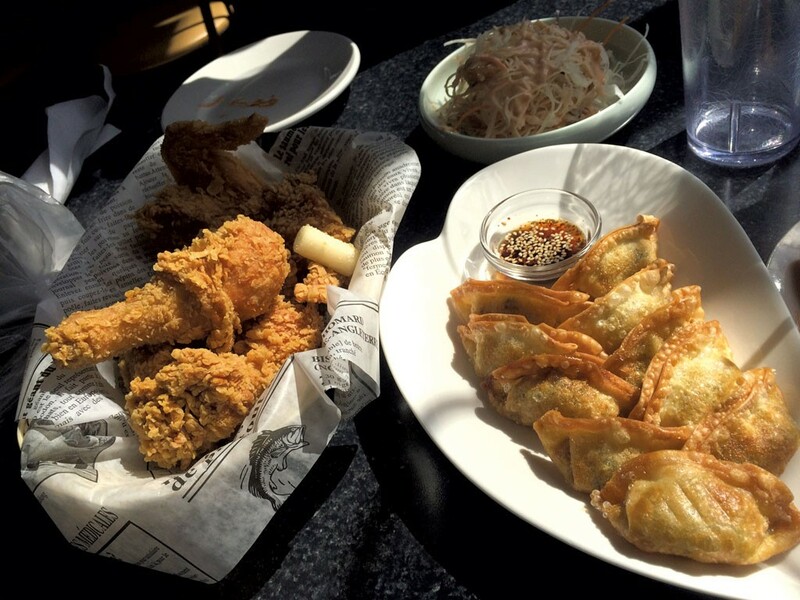 Recently, fried noodles, teriyaki and pork cutlet have joined the roster of fried-chicken varieties. While the western style is to butcher chickens into anatomically specific parts, Asian practice focuses on reducing the animal to bite-size pieces. In the case of DaWa, a whole chicken is broken down into 18 mostly cube-shaped segments. Wings and legs are left somewhat whole, but smaller, bone-in chunks may encompass only a rib or two. We ordered a 10-piece half-and-half chicken platter for $16.99. Five pieces of chicken were taken out of the fryer and dressed with nothing but a shower of parsley. The other five were tossed in what the DaWa menu calls Tao Coréen, a sweet-and-spicy take on General Tso's chicken. When our server took our order from behind the cheerful orange counter, backed by a fast-food-style picture menu, she asked in awkward English if we'd like the sauced pieces "mild or hot." Often, the only significant burn sauced KFC offers is the juice that bursts forth from the flesh onto the roof of your mouth. But the spicy Tao we chose was serious. Chiles created a flame so intense it was difficult to taste anything but heat and a hint of lightly caramelized sugar. As is typical of KFC, the chicken was coated thinly with sauce that merged with the crisp coating. But it took a taste of the unsauced meat to really get a read on its quality. The commonly stated reasons for frying the chicken twice, at only about 350 degrees, is to attain the thin, crisp jacket and an exceptionally juicy interior. The chicken at DaWa excelled in the former but not the latter. The blandest of the chickens we tried, DaWa's was also the driest. Perhaps this leads to more beer sales. Suds are so integral to the ritual of eating fried chicken that many Koreans refer to a meal of it as "chi-mek." "Chi" is short for chicken, while "mek" is an abbreviation of "mekju," the Korean word for beer. Here, though, beer options were limited to one tap and a few bottles and cans. Still, this was no excuse for the disappointing sides included in our meal: out-of-the-freezer fries and vinegary, Montréal-style coleslaw. This tiny storefront is clearly KFC in its most basic form. A few minutes away, also in the NDG, 7-month-old Restaurant Coréen Mon Ami is anything but basic. Korean teenagers sat in front of a flat-screen TV that played K-pop music videos. Only a few of them ate chicken. The menu also includes several soups, stews and noodle dishes. There's even jokbal, skinny slices of sweet, soy-braised pork trotter. Yet fried chicken is still the centerpiece of the menu. With Mon Ami's more formal feel, though, comes less flexibility. Unlike most KFC eateries, there's no half-and-half option. Most orders consist of a whole chicken prepared one way. Not that the place lacks variety. Rather than beer, we ordered a can of sikhye, an excessively sugary "rice punch." It's basically the sugar water you use to attract ants, plus floating chunks of rice with a cardboard texture. Drinking it hurt a little. Our palates were saved by a complimentary bowl of pickled daikon and a small platter of shaved cabbage covered in a salmon-pink blend of ketchup and mayonnaise. Our appetizers arrived quickly. Skewered rice cakes were crisp from frying and covered in a sweet-and-spicy sauce dominated by gochujang. A few black sesame seeds made it a visually appealing plate and, at just $1.25, it was difficult not to order more. But then deep-fried mandu arrived on a heart-shaped plate. The exact contents of the finely chopped dumpling fillings were mysterious, but cabbage and garlic were chief among the flavors. The $17.99 chicken was served in a basket lined with the classic chip- shop "newspaper," but in French. The bird's batter was slightly thicker, with more American-style carbuncles than usual. This made for an even crunchier coating, balanced by an orange-colored chile brine. A hallmark of KFC is that little is done to it before frying; it's usually not even seasoned until afterward. Brining the bird was a new twist, and the spicy juice gave the chicken several notches of extra pizzazz. A few fried rice cakes tossed into the basket for good measure made this the most idiosyncratic chicken we tried — and the one most worth a repeat performance. The newest KFC purveyor, the Basak, opened at the end of October between heavily trafficked rue Ste-Catherine and the Bell Centre. Despite its prime location, it was quiet on a Saturday night. Other guests who straggled in at about 9 p.m. seemed more focused on pitchers of cheap beer than on chicken. On televisions in each corner of the restaurant, young female rappers from the South Korean show "Unpretty Rapstar" and other K-pop royalty provided entertainment. The all-plastic and angular wood touches lent the room have a futuristic '60s vibe. Tables are equipped with bells to call the waitress, who, in addition to beer, might also bring soju or Korean plum liquor maehwasu. We decided to try one of Basak's homemade soft drinks. Kiwi soda turned out to be bubbly water lightly flavored with kiwi the natural way: Slices of the fruit bobbed along with the carbonation. It was an effervescent delight. The menu offers little besides fried chicken, though the bird is also available braised or served in a salad. The half-and-half is available with or without bones for the same price of $22.99. As at Mon Ami, the chicken was served with cubes of pickled daikon. We couldn't resist ordering a side dish simply referred to as "corn cheese," which was just that. A mini cast-iron pan was filled with kernels of corn and topped with mozzarella cheese that was browned in the oven. It was as much a taste of the Midwest as the Far East, but, classy or not, it disappeared quickly. The Korean word "basak" refers to the sound of crunching into food, but, oddly, the restaurant's bird was the least crisp of the lot. The batter was on the thicker side, and, at times, the garlic-flavored dredge that dressed the plain chicken was slightly doughy. The pieces rolled in sauce and sesame seeds fared better. Only a hint of sweetness marred the subtle spice and vinegar of the sticky coating. The chicken was far from perfection, but I had no complaints in the moment it sizzled across my tongue. And those meals were just the beginning of Montréal's KFC adventures. Especially with the States' now-powerful dollar, Vermonters can keep up to date on the crispy fun. The original print version of this article was headlined "The Other KFC"